The worst thing about eating is that you sometimes have to leave the house to do it; this truth has been plaguing humanity since the invention of the cave-apartment. It follows from this that the best part of the future is summoning our exact food cravings right into our dwellings, and great news: We now live in a futuristic utopia. 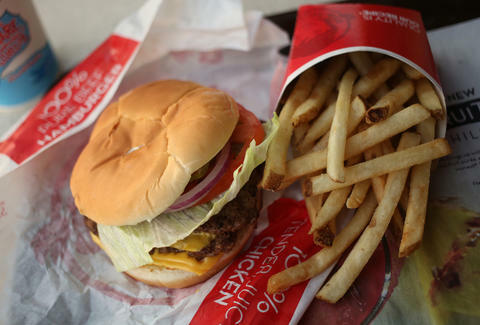 Wendy's just announced it'll offer delivery from a third of its locations by the end of the year. The fast-food giant is partnering with DoorDash to bring Frosties and fried foods to your domicile from 2,500 locations in 48 markets, so prepare for a pretty abrupt lifestyle shift as you transition from normal citizen to King of French Fry Carton Mountain. That leaves two-thirds of Wendy's 6,500 restaurants that won't be shipping you stacks of bacon and beef, but keep in mind that home delivery was only an option in Central Ohio and Dallas, Texas until very recently. If this goes well, we could be operating at close to full Wendy's delivery capacity in the near future, but that also depends on how DoorDash continues to expand its service areas. This move isn't just an act of service though; there's apparently serious money in delivery. “We’re seeing some significantly higher average checks,” CEO Todd Penegor said, according to Nation’s Restaurant News. It is, after all, far easier to bypass shame if all you have to do is reach your hand through your cracked apartment door. James Chrisman is a News Writer at Thrillist who will deliver news to your home if you wish. Send news tips to news@thrillist.com and follow him on Twitter @james_chrisman2.